I've never held Ditko in the same regard as some of the other great "founding father" comic artists, but hoped this collection would change that or give me something new to appreciate. No such luck. Don't get me wrong, the three issue Spider-Man arc here (culminating with the classic "lifting tons of machinery" scene) might be the definitive Spidey story and his trippy take on Dr. Strange has been the bedrock of anything mystic in the Marvel Universe ever since. But the guy also created Speedball and Squirrel Girl.The early sci-fi stories are a rarely seen bit of history, but not particularly entertaining and the hodgepodge of superhero stuff seems like filler, lacking any real standout qualities. Ditko's philosophy and the way it shaped his storytelling is the most interesting thing about the man and it is never addressed here, the most glaring omission in a collection in need of substance. I don't adore Ditko's art style, but he drew a LOT of classic Marvel stores, so this is quite a trip down memory lane. It's also fun to see how often Stan Lee used to inject himself and Ditko into their own stories in the early days. Some great stuff here, particularly the Spider-Man issues #31-33 and all of the Doctor Strange stories. The rest of it varies wildly, including some okay stuff and some real dreck (most of which is the fault of the writer, not Ditko). 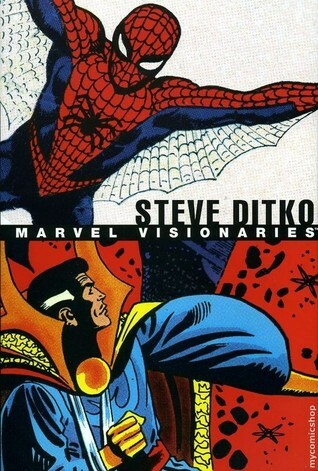 Very unique individual is Steve Ditko. He went all out on a lot of his stories. He did feel very heavily slighted by Stan Lee. Steve Ditko Stan Lee Bill Mantlo - Stephen J. "Steve" Ditko is an American comic book artist and writer best known as the co-creator of the Marvel Comics heroes Spider-Man and Doctor Strange.He was inducted into the comics industry's Jack Kirby Hall of Fame in 1990, and into the Will Eisner Award Hall of Fame in 1994.